As part of NYC’s Northside festival Thao Nguyen as of Thao with the Get Up and Get Down played a combined set with Mirah with both combining bands and performing songs from each others catalog. Great idea, great show. 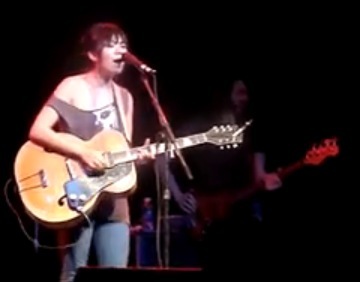 Since Thao’s songs feature double tracked vocals and backing vocals, it was great to have a few additional strong female vocalists to reinforce the lead live. TSOI regulars might remember that Thao with the Get Up and Get Down scored a big hit with me with their album Know Better Learn Faster easily making my best-of 2009. I am pretty shocked that this album was not regarded as a stand-out album by more critics. There are, I am afraid, many such mysteries in life. Anyway, Here is “When We Swam” as performed by Thao and Mirah’s super-group. I’m not the biggest fan of Thao, but I am digging this track. Less singer/songwriter than what I’m used to from Thao with the Get Up and Get Down. I can get behind the more rockin’ sound.